This page is for the 2005 reboot. For the original 1987 game, see The Bard's Tale. All versions also include The Bard's Tale, The Bard's Tale II: The Destiny Knight and The Bard's Tale III: Thief of Fate. The retail release includes DOS versions of the original trilogy while digital releases include emulated Apple II/Apple IIgs versions. Delete or rename bardtale.wmv, inxile.wmv and ttslogo.wmv. The copyright screen and book opening animation will still be shown. Included classic games are unpacked to in the configuration file(s) location when you run the game as bt1d2.2mg, bt2d2.2mg and bt3d2.dsk. Or if you want to unpack them without running the game, see here. Set with <path-to-game>\Config\The Bard's Setup.exe on Windows. Toggle with ⌘ Cmd+F on OS X, Alt+↵ Enter on Linux. Use the steps below to enable for Windows. Download The Bard's Tale (2005) windowed mode. Extract d3d9.dll into the installation folder (the other files are not used). 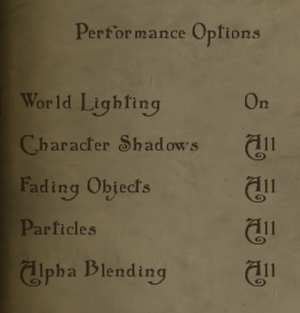 Set your resolution with <path-to-game>\Config\The Bard's Setup.exe. Use the desktop resolution for borderless. The window is locked to the top-left corner of the screen. Delete d3d9.dll to return to fullscreen mode. XInput controllers (Xbox 360 controllers) must use XInput Plus for support with LT and RT. Must turn on Gamepad support in the options menu. Button prompts are numbers instead of names. Master, SFX, Dialogue and Ambient. Game language can be changed using Config\The Bard's Setup.exe in the installation folder. Classic games are English only. 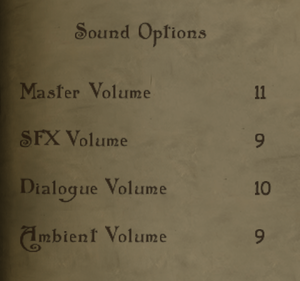 Audio localization is avaliable only in the local retail version. This page was last edited on 19 March 2019, at 14:30.